We’d love your help. Let us know what’s wrong with this preview of At War With the Wind by David Sears. In the last days of World War II, a new and baffling weapon terrorized the United States Navy in the Pacific. To the sailors who learned to fear them, the body-crashing warriors of Japan were known as "suiciders"; among the Japanese, they were named for a divine wind that once saved the home islands from invasion: kamikaze. Told from the perspective of the men who endured t In the last days of World War II, a new and baffling weapon terrorized the United States Navy in the Pacific. To the sailors who learned to fear them, the body-crashing warriors of Japan were known as "suiciders"; among the Japanese, they were named for a divine wind that once saved the home islands from invasion: kamikaze. Told from the perspective of the men who endured this horrifying tactic, At War with the Wind is the first book to recount in nail-biting detail what it was like to experience an attack by Japanese kamikazes. David Sears, acclaimed author of The Last Epic Naval Battle, draws on personal interviews and unprecedented research to create a narrative of war that is stunning in its vivid re-creations. Born of desperation in the face of overwhelming material superiority, suicide attacks-by aircraft, submarines, small boats, and even manned rocket-boosted gliders-were capable of inflicting catastrophic damage, testing the resolve of officers and sailors as never before. Sears's gripping account focuses on the vessels whose crews experienced the full range of the kamikaze nightmare. From carrier USS St. Lo, the first U.S. Navy vessel sunk by an orchestrated kamikaze attack, to USS Henrico, a transport ship that survived the landings at Normandy only to be sent to the Pacific and struck by suicide planes off Okinawa, and USS Mannert L. Abele, the only vessel sunk by a rocket-boosted piloted glider during the war, these unforgettable stories reveal, as never before, one of the most horrifying and misunderstood chapters of World War II. To ask other readers questions about At War With the Wind, please sign up. The only other book that's ever taken me this long to read was Anna Karenina, and I despised that book as well. I felt compelled to finish this, but it was not the insightful book on kamikaze pilots I sought out. In fact, as other reviewers mention, the first 135 pages of this book don't even really discuss kamikaze pilots. I've read quite a bit of Pacific War nonfic at this point, so I didn't need the primer and would have appreciated more research into the Japanese mindset and the kamikaze pil The only other book that's ever taken me this long to read was Anna Karenina, and I despised that book as well. I felt compelled to finish this, but it was not the insightful book on kamikaze pilots I sought out. In fact, as other reviewers mention, the first 135 pages of this book don't even really discuss kamikaze pilots. I've read quite a bit of Pacific War nonfic at this point, so I didn't need the primer and would have appreciated more research into the Japanese mindset and the kamikaze pilots than continual lists of damage. David Sears has migrated from the Civil War to WW2. He can be a lucid writer with some interesting turns of phrase. I've liked his CW work in the past and was expecting a similar result this time, but it seems he missed his target with the kamikaze campaign. There is too much material from the American side and we see only snippets of the Japanese thought process and strategy in the waning days of the war. In addition, far too much time is spent in a blow by blow summary of the Pacific War from David Sears has migrated from the Civil War to WW2. He can be a lucid writer with some interesting turns of phrase. I've liked his CW work in the past and was expecting a similar result this time, but it seems he missed his target with the kamikaze campaign. There is too much material from the American side and we see only snippets of the Japanese thought process and strategy in the waning days of the war. In addition, far too much time is spent in a blow by blow summary of the Pacific War from the Pearl Harbor all the way through the Marianas, surely something that any reader of a book like this does not need. One does not casually pick up a campaign history of the kamikaze without background knowledge of the conflict it encompasses. We are deluged by sailors' remembrances of their ordeals and it is impossible to remember more than two or three, a common failing these days in grunt eye views of combat. There are also asides that have nothing to do with the main topic, such as the typhoon fiasco. It seems this this kind of dispersion of effort is all to typical of the kamikaze sub genre in WW2 history. I am still in search of the definitive study of this topic. The start is somewhat disappointing. Page 123 and scene setting is still underway and the word "Kamikaze" has yet to be seen. Despite this the presentation is easy to read and understand. On completing the read, the most astonishing fact to emerge was the level of damage actually achieved by the Kamikaze operation. It was much greater than the majority of previous references describe, and the impact was also more widespread. Overall worth reading to get a better view of the details of the Kamika The start is somewhat disappointing. Page 123 and scene setting is still underway and the word "Kamikaze" has yet to be seen. Despite this the presentation is easy to read and understand. 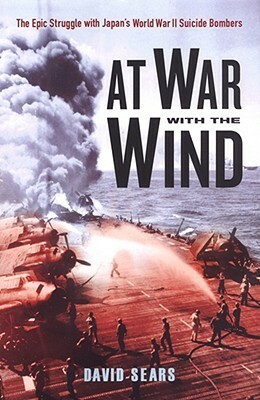 As the 70th anniversaries of the major Pacific naval battles of 1944 and 1945 approach, At War with the Wind is a terrific tale to read of the carnage wrought by the Japanese "Divine Wind" -- the Kamikazes. Described as an "epic battle between those determined to live and those determined to die", the fight against the suicide pilots, their motivations, and the efforts of the defenders makes fascinating historical reading. David Sears is a New Jersey-based author, speaker and business consultant. David's early career included service as a United States Navy officer with extensive sea duty aboard destroyer Gearing (DD-710) and a tour of duty as an advisor to the Vietnamese Navy during the Vietnam conflict. David's Navy service and sea-going experience brings unique authenticity, perspective and passion to his books an David Sears is a New Jersey-based author, speaker and business consultant. David's early career included service as a United States Navy officer with extensive sea duty aboard destroyer Gearing (DD-710) and a tour of duty as an advisor to the Vietnamese Navy during the Vietnam conflict. David's Navy service and sea-going experience brings unique authenticity, perspective and passion to his books and his presentations to veteran, school, civic and business groups.